Back when I became vegetarian so many people asked me what I could eat. But recently I have been thinking about how many of my traditional family meals I have been able to reclaim as a vegetarian. It is a comfort. I am glad to be able to draw on the memories of my mum’s good food. One such dish is Shepherd’s Pie. Mum always made it with mince meat in a dark gravy topped with crispy mashed potato and served with tomato sauce. Once I became vegetarian I discovered there were many ways to make Shepherd’s Pie. One of my favourites is the one in Mollie Katzen’s Enchanted Broccoli Forest. Another interesting variation is Sophie’s Spring Cottage Pie that I saw on Mostly Eating some months ago. Sophie also brought up something that has been a mystery to me. She says that Shepherd’s Pie refers to one made with lamb, and Cottage Pie refers to one made with beef. When I checked Wikipedia and Food Timeline this seemed to be generally agreed, although there was some talk of the terms being used interchangeably. Shepherd’s Pie seems to have originated in the North of England and Scotland where there were a lot of sheep. There is a suggestion by John Ayto that the name Cottage Pie came from the ‘pleasantly bucolic associations’ when lamb and mutton disappeared from such pies. Neither pie came into common use til potatoes were acceptable as food in the UK in the Eighteenth Century. It seems that the term Shepherd’s Pie only dates back to the 1870s. Interestingly Shepherd’s Pie seems to have traditionally been a way of using up leftover roast meat. Which makes sense to me as I remember my mum with a hand mincer that she had attached to the edge of the table with a vice – it always was quite fascinating to watch as a child. But that was before I knew that we were eating our pet lambs! These days I use neither beef nor lamb so I feel maybe a new name would be appropriate. I’d quite fancy Market Gardener’s Pie or even Vegie Patch Pie. But I can’t help using the name I grew up with - Shepherd’s Pie. Even if it is very different to that which I ate as a child. Unlike Mollie and Sophie who made their pies with no tomato sauce, I stuck to the vegetarian t radition (if I can claim such a thing) of a tomato sauce filled with legumes and vegetables. I wanted a hearty rich dish hearty to stick to our insides in the dark days of winter. I have written out how I made mine recently. I didn’t follow any particular recipe but would not claim my recipe is definitive as I would make it differently each time. We had leftovers the next night and I thought the mashed potato was not nearly as soft and fluffy as the first night we made it. I often put cheese on my Shepherd’s Pie but decided to put some pesto in the mash instead which worked a treat. I put 2 tsp of tamari in the mixture and found it too salty but found this was fixed by adding lemon juice. I was late making it so E was too hungry for me to wait long for it to crisp up much on top but we did get a little crisping and a little bubbling. It feels like real comfort food to me when it is golden crisp with edges browning and the filling bubbling up the sides. Then there is the marvellous moment that the serving spoon cracks through the crispy potato into the oozing steaming sauce. Like putting on a comfy old sweater. But delicious! Heat oil in a stockpot over low heat. Add onion, garlic, carrot and celery and fry for about 5-7 minutes, stirring frequently. If bottom of stockpot is getting too brown, add half a glass of water. Add tomatoes, wine, tomato paste tahini, tamari, lemon juice, bayleaves and water. Bring to the boil and stir 1-2 minutes. Add button mushrooms, pumpkin, zucchini and porcini. Bring to the boil, cover and simmer for about 15 minutes, or til pumpkin and zucchini is just soft. Stir in lentils and black pepper. Check seasoning. Remove bay leaves. Set aside til potatoes are ready. While the vegetables are simmering, place the potato in a medium saucepan with some water. Bring to the boil, cover and simmer about 15-20 minutes until potatoes are soft when a knife or fork is pushed in. When potatoes are cooked, drain and add butter and milk. Mash with a masher and then use a spoon to stir some air in and smooth out most of the lumps. Then stir in pesto til combined. Put about 2/3 of the filling in a 23cm square ovenproof dish. This left me with the vegetable sauce to use elsewhere. You could use it all in a bigger container if you choose to have either a thinner covering of potato or even cook more potato. But unless you are cooking for a big group, I would advise putting some of the vegetable sauce aside in the fridge or freezer and mashing fresh potato another night because it is so much better when the potato is fresh. Spread mash on top of vegetable mixture. Rough up the mash with a fork or back of a spoon so it has lots of texture to get crispy in the oven. Bake in the oven at 200 C for about 30 minutes or until mash is crisping up. It seems strange how we are inspired to cook. I have recently written about necessity and ease as reasons to cook particular recipes. But a couple of weeks ago I made a soup which I wanted to make simply because of the photo in the cookbook. So when I opened my old tattered Alison Holst’s Meals without Meal and saw the gorgeous photo of the Creamy Lentil and Vegetable Soup in an earthernware pot surrounded by artistically arranged herbs and lentils and vegetables, I decided I had to have it. I am not usually very enthusiastic about creamy soup but this one has just a hint of milk (and I am sure any sort of milk would be fine but we have only cow's milk given that E uses it more than me and it all tastes the same to me). I wasn’t terribly organised about buying for the soup but mostly concerned about using up a few vegetables from the fridge that needed rescuing – some spinach and cherry tomatoes. So I have adapted the recipe to give it the culinary virtues of necessity and ease. It seems an appropriate time to share with you my most recent favourite phrase 'leguminous evangelist' which I found in a Dalziel and Pascoe novel by Reginald Hill called Bones and Silence. I am a big fan of this crime series. For those of you who have seen them on television, the books are much better with wonderful description and detail. If you have never heard of this detective team, I can highly recommend the books for great humour and insight into Yorkshire ways. Any writer who uses the phrase ‘leguminous evangelist’ is bound to amuse and entertain. So this soup is dedicated to all those leguminous evangelists out there. My photo has none of the charm and temptation of the photo in Alison Holst’s book but the soup did indeed taste wonderful. It was especially good with some warm buttered beer bread. Place the lentils, boiling water, stock powder and porcini in a large jug and set aside. Heat oil in large saucepan. Gently fry onions, garlic, carrots, celery and garlic in oil over low heat for about 2-3 minutes. Add hot water and lentils mixture and peas to saucepan. Simmer about 20 minutes or till lentils are soft. Gradually add the milk to the cornflour in a small bowl till combined. Stir cornflour mixture, tomatoes and spinach into soup and simmer about 5 minutes. Check and adjust seasoning. Ever since I made tabbouleh (tabbouli) recently and Ricki pointed out it was not gluten free, I have been wondering if it is possible to make tabbouleh with quinoa. A quick search of quinoa salads on the net brought up Susan’s International Quinoa Salad. Not tabbouleh but it was adapted from a recipe by Lorna Sass called Quinoa Salpicon which is closer to tabbouleh. It is the grains and parsley and tomatoes combination with a lemony dressing which is reminiscent of it. I was thinking about making tabbouleh because we had leftover Turkish bread and hummus from a falafel meal. Fate wasn’t helping. One night I went to buy all ingredients because I was passing the supermarket but I found my purse had been left at work. A few nights later with no trip to the shops planned, I thought I would try to make do with what was in my kitchen. Making do with what we had meant not much parsley and lots of lemons. I welcomed another chance to use a lemon from our tree which I had been saving for a special dish. Which made me wonder why both Susan and Lorna warned one should use lime juice not lemon juice. When I am feeling lazy I often just squeeze some lemon juice over vegetables for a salad. But on this occasion, I wanted to make a put in a little more effort with a dressing for Holler and Lisa’s No Croutons Required event which this month is hosted by Lisa and focuses on dressings on soups or salads. I would have preferred lots of parsley to cut through the grains. I find that grains (rice, bulgar, quinoa, etc) in a salad can overwhelm the vegetables and make the dish a little stodgy. But making do meant I only had some meagre handfuls from our parsley plants which have enjoyed the recent deluges of rain but never flourished in the way I had hoped. Incidentally, my desk calendar recently told me that parsley only flourishes in a house where women are dominant. So readers with parsley in your garden, you can now read some meaning into your parsley plants if you would like to believe Schott’s Miscellany. My salad was not at all what I would term a tabbouleh but does make me hopeful that I might try a quinoa tabbouleh in the future. It was not without some glitches that, if I was the sort of cook to try a recipe over and over, I would perfect before posting this but I thought that could take some time so here it is with my comments. The quinoa took a little longer than intended because I burnt the first batch of quinoa. I am not familiar enough with cooking the grain to feel comfortable with timing but I should have followed my instinct that told me something was burning. But when I reduced the time, it was fine. I enjoyed the lemony dressing but it was a bit sweet. I added salt which didn’t help so I think next time I will reduce the honey or even increase the black pepper. I would also possibly increase the vegetables next time. But all musings aside, it was a tasty salad that went well with the Turkish bread and the last dollops of hummus. And it helped me use up a bit of the quinoa and lemons that seem plentiful in my cupboards right now. Place quinoa and water in a small saucepan with a lid. Bring to the boil and simmer gently for about 15 minutes. Turn off the heat and let sit for about 5 minutes with the lid on. Cool quinoa while you prepare vegetables and dressing. To make dressing mix all ingredients in a small bowl with a spoon or a whisk. Add vegetables and dressing and toss to combine. I was going to call this beer bread the easiest bread in the world, until I remembered that Australia has damper which at its simplest is flour and water. I have written before on childhood memories of damper which my mum cooked in the ashes of the barbeque. But beer imparts so much more flavour that I did wonder why our swaggies weren’t traditionally pouring beer into their flour instead of water or milk. But then I reasoned that they probably weren’t going to waste beer in a bread, if they had it. Thinking about how beer bread is so easy, I thought it would be great for a Johanna at the Passionate Cook who is hosting this month’s Waiter There’s Something in My … because the theme is picnic basket. While I like to eat good food at picnics, I like simplicity of preparation when eating in the great outdoors away from the mod cons of the kitchen. The bread is easy enough to whip up the morning of a picnic and would tastes fantastic fresh served with some dips or cheese. But, if it is not picnic weather, it will keep a few days and toast up a treat. I have had this recipe for more years than I care to admit. One of my friends worked in a café in Carlton as a student and passed it on to me. I think Tania was the café owner but it is too long ago to remember if she served the beer bread in the café – I think she did! She should have because it is far more impressive than the effort required would suggest. The magic of this bread is the yeasty smell, thick crust and great texture. This bread doesn’t crumble and collapse. It is soft and fluffy but sturdy enough to toast. Mine was a tad sweet. The sweetness could be that the page in my recipe book was smudged where the sugar measurement was given so a little guess work was required – the joys of old recipes (1 tbsp was too much for me)! But I guess the sugar feeds the yeast in the beer. There is no specification of what sort of beer in my recipe. I used a local lager, Victoria Bitter, and have decided this bread is probably better with a light lager after using stout in Oatmeal Beer Bread recently (which is a different sort of bread that requires waiting for yeast to rise). There are lots of variations on this bread. My recipe suggests that you could grate cheese on top before baking. Ricki at Diet, Dessert and Dogs gives a wheat free (but not gluten free) recipe using spelt and dresses her bread up with herbs, olives and sun dried tomatoes. I have another beer bread recipe with bran and other flours. You could add other flavours but I like it simple. I dug the recipe out the other day to serve with some soup when I was having a bread crisis. Thankfully the crisis is over and good bread has returned to my life (after too long of not being able to get organised to buy bread anywhere but the supermarket) but I am determined to remember to make this bread occasionally because it is just so good and so easy. Mix all ingredients together in a mixing bowl. Scrape into greased and lined loaf tin (my loaf tin is about 21 x 13 cm). Don't worry too much about smoothing the top - this can be rustic and uneven. Baked at 220 C for about 50 minutes or til skewer comes out cleanly. Last night we had pie for dinner. I had other plans but it I had left my wallet at work. So it was a matter of foraging in the fridge. Luckily E wasn’t at work earlier in the week and had been out doing his hunter-gather thing. He had bought us individual pies at a local bakery. They were very nice (once we had worked out which one had meat in it). We don’t usually have pies frequently but it seems pies are hard to avoid at the moment – they were even featured in my novel I was reading last night. Last week even more unusually, I baked pies from scratch. Yes, I even made the pastry! As I have said before I don’t really like making pastry much. It is too fiddly and prone to falling apart. But I know there are some who dislike it for its high fat content. A former housemate of mine used to make a pastry from my A Vegetarian Feast cookbook (by Vikki Leng) because it was lower in fat than most pastries. This pastry has been on my mind for a while because I have fond memories of it. I was inspired to share the recipe by Helen from Food Stories who has been experimenting with low fat pastry. What’s not to love about a pastry that is not likely to fall apart, doesn’t need blind baking and tastes good without being full of butter. So I finally made it last week. If you expect this to taste like a melting buttery pastry, you will be disappointed. But if you want to try a pastry that is substantial and chewy, that resists the sharp knife rather than crumbling under it, and that is more scone than tart, you will find it pleasing. And it is not just me who enjoyed it. We hadn’t finished our first piece of pie when E was asking that I make this more often. This is a great healthy pie. Easy to make and packed with vegetables. The vegetables could be changed according to whim and season. My main problem was that our pies were a bit lacking in seasoning and vegetables can be too sweet, especially pumpkin. But this is easily fixed and will not dissuade me from making them again. These pies are great winter comfort food, especially when the pastry presents so few challenges. To prepare the filling, place all vegetables, water, and stock powder in a microwave proof bowl cover and cook in microwave on high for about 25 minutes, stirring every 5 minutes to check if vegetables cooked through. Vikki suggests alternatively boiling the vegetables in a bit more water but I think pumpkin holds its shape better when you cook it in the microwave. She also advises you cool and drain the vegetables once they are ready. A nice idea for those organised souls with time. I am sure cold vegetables are easier to drain than hot ones. But hot vegetables can be drained with a slotted spoon, oven mitts and preferably a helpful partner. I kept some of my excess water for the pastry. Set aside to cool while you prepare the pastry. To make the pastry: Mix flour and baking powder in a medium bowl. Melt butter in a small bowl (in microwave) or saucepan (on stovetop) and add oil and water. Mix liquid mixture and flour mixture to make a stiff dough. Mine was so stiff I added a couple of spoons of extra water till it was pliable. Briefly knead dough on a lightly floured surface till smooth (about 30-60 seconds). Pre-bake pie crusts in a moderately hot oven (190 C or 350 F) for about 10 minutes. The pastry cooks only ever so slightly which is plenty for this type. Now that the vegetable filling has cooled a little, check and adjust seasoning. Divide up filling between the pie crusts. Don’t worry if the filling is still hot, it will be fine. Sprinkle with grated cheese and seeds. Return to the oven for 30-40 minutes. The recipe says to serve topped with parley and tomato slices. I preferred to serve it with a little salad and topped with some tomato sauce. I put one of my pie crusts in the freezer after it had baked for 10 minutes and placed the filling in a separate container so it was an easy dinner to assemble in the week after work. Just make sure you drain the filling again after defrosting. Well in my last post, I wrote about the issues of posting others’ recipes in the blogosphere. So tonight I thought I would write about recipes from scratch. As I will readily admit, I don’t post many meals that I make with no recipe in sight. They often don’t seem so exciting. But I also find it hard to pin them down. They are a bit of this and a bit of that with maybe another few minutes here. Not terribly precise. I have decided to post this lasagne because I noticed I have posted some lasagne recipes that have interested me as being a little different from my normal style. But not having posted my usual lasagne makes these others look like what I mostly eat. No. They are special treats. My bog standard is a variation on a vegetarian bolognaise sauce layered with pasta and some cheese sauce, topped with cheese and seeds, and baked till crispy golden. I think I first learnt to make it when I lived in the student household where I became vegetarian many years ago. I don’t feel it is a recipe I own because I picked up a lot of it from housemates and recipes that I consulted before instinct kicked in. But I have made it enough to do away with recipes. The only thing that can be a challenge is getting the amounts right. It is different every time depending on what is in the kitchen. So I decided to post it to show you one of my standards (which sit in my repeat repertoire along with meals like dahl, mexicale pie and tacos) and to make a record for myself for next time I am wondering about quantities. I make no claims for it being amazingly original or special. If you search the internet, I am sure you will find many similar recipes. I swithered over how to write up the recipe. Should I make the recipe neat with the ingredients list showing all the vegetables already chopped or do I let the method reflect my style of chopping as I go? Should I give all the possible options or just do a snapshot of the night in question? Am I writing to reflect on what I did or to tell you what I should do? I have tried to capture this moment but exact amounts are not needed in this sort of recipe. I often just grab a handful as I feel like it so the measurements are meant as a guide only. This includes my habit of using the empty tomatoes tin as a measuring vessel which I do to rinse the tomato juice from the tin in the most economical way. This recipe has quite a bit of flexibility. 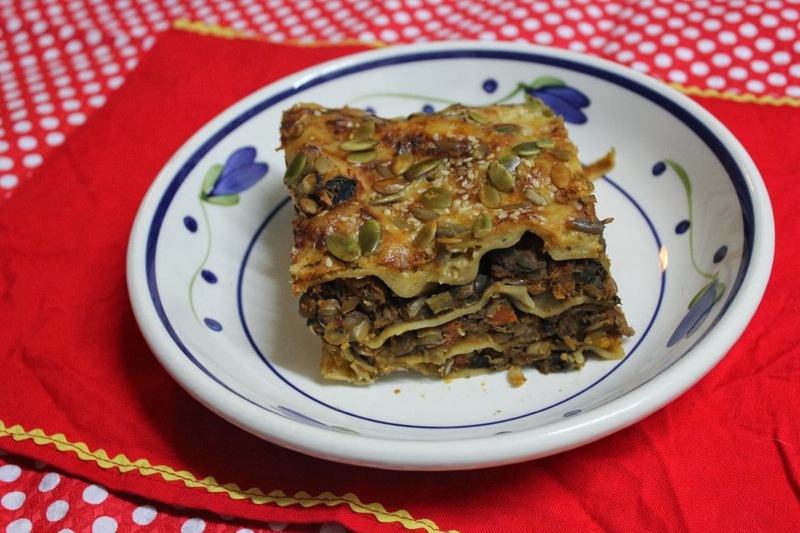 I often use dried lasagne sheets but have lately been enjoying using fresh lasagne sheets which are richer. I don’t always use tempeh and sometimes use other proteins such as tofu, more beans or nut roast. The vegetables are some of my favourites for lasagne but can be changed according to season and whim. While it takes a while to compile, it will last a small household almost a week. Lastly I get struck by uncertainties about if I should give it a name to enlighten or entertain. In the end I stuck with the name I would use which is neither enlightening nor entertaining but is solid and comforting, just like this dish. I am sending to this Susan at The Well Seasoned Cook for My Legume Love Affair event in August because I like beans in my lasagne. To make bolognaise sauce: Heat oil in large stockpot over medium heat. Add onions and tempeh and stir for about 10 minutes or till browned. While these are browning, dice carrot, chop garlic and add both to pot. If mixture is sticking to the bottom of the pan, add a splash of water. Add tomatoes, water and wine and cook for about 30 minutes. Bring to the boil and reduce to a simmer (mostly on low heat but I sometimes need to fiddle with the heat as vegies are added). While bolognaise is cooking, chop and add remaining vegetables, plus seasoning. Alternatively, if you are not a mult-tasker with limited time who likes to chop vegies and keep an eye on the stockpot, you could chop all the vegetables prior to cooking. In this case, I would recommend adding all the seasoning, liquids, beans, and pumpkin when you add tomatoes, adding zucchinis and capsicums 10 minutes later and then mushrooms 10 minutes later. Simmer for another 10 minutes. Turn off the heat and set aside. To make white sauce: Melt butter in a medium saucepan over low heat. Mix in flour and stir the mixture over low heat for 1-2 minutes so the buttery flour mixture browns ever so slightly. Add milk gradually, mixing as you add it. Bring to the boil so that the sauce thickens. Stir in mustard and soy sauce. To assemble lasagne: Place a few small spoonfuls of mixture on the base of a large metal dish (I use my large roasting dish which is about 35 x 25 cm). Place a layer of lasagne noodle, then a spread a third of the bolognaise sauce over the noodles Top with another layer of noodle. Repeat layers of bolognaise sauce and lasagne noodle twice till you have finished with noodle on top. Pour the white sauce over the top layer of noodle and spread to cover. Sprinkle with cheese and seeds. Bake in 200 C oven for about 45 minutes or til top is crispy. If I use dried lasagne noodles I put a knife in to check the noodle feels soft and cooked but with fresh noodles, there is no concern that the noodle might not be cooked. Eat hot. Serve with salad, garlic bread and/or steamed vegetables if desired. We ate this over 4-5 days and it kept in the fridge over that period. Update August 2013: I have updated the top photo - this one was made with lentils and different vegies but used the same method. Do I dare to cook with one less pear? I was horrified at reading Melissa’s post (thanks for the link, Mary) last weekend about being told by America’s Test Kitchen that they did not allow their recipes to be modified in print because they are tested they up to 100 times. The implication that there is one perfect version of any recipe seems ridiculous, esp, potato salad which was the recipe Melissa had posted. We all have different preferences, different kitchens, and different diets, as I have written about before. No matter how many times you test a recipe for potato salad, my sister and I will always disagree on a perfect version because she loves bacon and boiled egg in hers and I will not eat either of these ingredients. This doesn’t mean we can’t each have versions that are perfect to each of us. There are now 278 comments in reply to Melissa’s post which shows it has really hit a nerve in the blogging community. There is a lot of respect on blogs for not reproducing recipes verbatim – but the idea that you should not cite your sources of inspiration when you adapt a recipe seems wrong. Unfortunately, this is what America’s Test Kitchen seems to imply. But my experience of blogging is that we like to give credit where credit is due. I like blogging because I like the interactive sharing of recipes. Melissa’s experience led her to read up on copyright. What she found is that a list of ingredients is not copyrighted, but the methods re copyrighted if they have literary merit (eg ‘bring to the boil’ does not but ‘watch the little bubbles rise to the surface of the water like a school of dolphins coming up for air' does). I know there are bloggers who will only write up a recipe if they have modified the ingredients but I find that, even if I use the same list of ingredients, my method often is slightly different (and I always rewrite the method in my own style). I agree with Neen, that we are promoting the magazines or cookbooks. After all, even if I really wanted to, I would not be able to cook everything out of a magazine or a cookbook. It seemed even sadder to read this last weekend because it was the Melbourne bloggers meet at Lentil as Anything in Abbotsford (followed by a drink at Handsome Steve’s Bar), organised by AOF. It was a relaxed get-together of a group of friendly and generous people. This is much more the spirit of blogging than America’s Test Kitchen. Fortunately for me I have much more to do with the former group than the latter and will continue to share recipes. Which brings me to today’s recipe. I had made this Spanish Vegetable Casserole before reading Melissa’s post but had been pondering issues of reproducing it. I found the recipe in a Tesco magazine when I lived in Edinburgh probably about 6 or 7 years ago. I had been thinking that there shouldn’t be problems with putting recipes from this magazine on the net because it is so unlikely that most people would be able to find a copy of it, apart from in charity shops and doctors’ waiting rooms in the UK. Magazines are the ephemera of the publishing world and I really like how blogs dredge up old recipes that I would never find, because I didn’t buy the magazine at the time. It is not just magazines where recipes are hard to find. Blogging has made me aware that there are local cookbooks which are hard to find outside Australia, and many cookbooks go out of print all too fast. (If you don’t believe me on this last point, check out this article on cookbook collecting in The Age newspaper last week.) Besides, my experience has been that I have been more likely to find out about and buy new cookbooks since starting blogging, and my reading of other blogs suggests I am not alone. My second point, raised by the Spanish Vegetable Casserole, is the issue of modifying recipes. It calls for the addition of two pears. (As an aside, I have never thought of pears as particularly Spanish and was curious as to whether anyone knows of other savoury Spanish recipes with pears in them.) I love eating fresh pears but am a little dubious about cooked pears, which may be one of the reasons it took me so long to try this recipe, but I was curious. Now I have made it, I would only add one pear next time, because the pears added a considerable amount of sweetness to the sauce. But again, this is personal preference, rather than an imperfection in the recipe. I think I added more stock the second night we ate it but I would recommend this as a good hearty winter stew. Update Sept 2009 - just saw this article from Not Quite Nigella today on ACP asking her to remove recipes from an Australian Women's Weekly Cookbook. Seems we have just as many problems in Australia. Fry onion in oil in a large saucepan for a few minutes over low to medium heat til translucent. Add potatoes, paprika and garlic. Stir for about 1-2 minutes. Add remaining ingredients. Bring to the boil, cover and simmer for about 30 minutes or til potatoes are tender. Season and serve with bread or rice.